Roger Reece tackles the subject of stress in the following clips, taken from recent training workshops with Roger Reece Seminars. 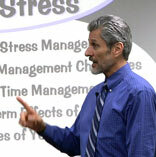 Roger discusses the sources of stress and offers a wealth of strategies and techniques for managing stress from both its external and internal causes. 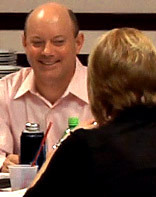 Our Stress Management programs are among the most popular and highly-sought-after topics offered by Roger Reece Seminars, and consistantly bring wide praise and some of our most enthusiastic responses from participants. To find out more about many of the topics we cover, visit our Youtube channel to see dozens more clips from other Roger Reece Seminars training programs. There is no limit to the number of future catastrophes we can imagine happening to us someday. The potential for worry is endless. We can waste a lot of our energy and resourcefulness worrying about things that might happen in the future. We can cause our brains to shut down over things that do not even exist. If we can only get really good at learning through change and navigating the unknown, we can free ourselves from unproductive speculation and put all our resources into dealing with the problems we do have today - and maybe have the resourcefulness left over to start taking steps to prevent many of those future calamities from ever occuring. What happens in reactive frames is that we're not thinking about all the possibilities. It becomes a very tight frame in which the way that we think about the situation becomes very limited. The challenge of emotional intelligence is to look at the patterns behind the situations that have caused you to react negatively in the past, and to consider these situations from the perspective of what you would like to happen in the future. What are the things that tend to trigger you? What happens to you when you are triggered? What are the behaviors that caused these situations to go badly? Figure out what went wrong in the past, and you'll be better able to avoid these mistakes in the future. The external and internal sources of your stress: What we experience as stress is actually the fight-or-flight response: an involuntary, emergency-alert response to danger that surely must have saved the life of prehistoric man countless times over. These days, however, most of the stressors that trigger the fight-or-flight response are actually not physical dangers at all. This makes no difference to our nervous system, of course: as long as the threat is perceived - be it emotional, psychological or otherwise - our bodies still go through the same adrenaline roller-coaster ride as if we were to look down and spot a rattlesnake coiled at our feet. But is it possible that two people could work with the same external factors, and one could be more stressed-out than the other? Of course it is. External elements that cause conflict and difficulty are a constant - but our internal reactions to these factors, as well as the particular triggers that spur or aggravate a stress response within us, are as individual as we are. Managing the stress-inducing commentator in our heads is a foundational principle of stress management. We all have a voice running through our heads every day: a commentator giving real-time analysis of events as they occur while we move through the course of our day. We know this voice belongs to us, we take for granted that it reflects how we feel - yet we rarely stop to consider how this "color-commentary" colors the way we interpret the narrative of our lives. Worry, frustration, indignation, suspicion - just about any state that will cause or exacerbate stress, can also serve as a perfect template to filter disjointed events into a familiar story pattern. And if psychology and neurology have taught us anything, it's that the human brain loves stories and patterns more than almost anything! Whether we know it or not, we all fall into habits of "reading" what we see in certain ways. We learn to communicate in large part by seeing the effect of our words and our tones on other people. We all understand, to some degree, the value of tempering the way we speak in order to get the response we want from others. Shouldn't we give the same consideration to the effect of our own, inner voice on what we think and do? Creative reframing of problems as opportunities: When something happens that we don't like, we tend to frame it as a problem. This is a natural, reflexive reaction to unwelcome events: an "I don't like this" message from the brain. It can have an immediate and powerful effect on our state and stress levels. To combat this, we have to learn the process of reframing events: a "creative reframing" of what is happening from a Problem to an Opportunity. Disappointment is a product of expectation. But regardless of what we hope or expect to happen, when a moment arrives there is nothing we can do to change it. All we can ever hope to change is what might happen in the future - and we sabotage our ability to do so if we let disappointment determine our state and stress us out. Everything that befalls us that is a problem can be looked at as an opportunity: an opportunity to learn something new, to practice new skills, or to experience something from a new perspective. We need patience, determination and commitment in order to do this. But the alternative - to dwell on our image of What Should Be and refuse to accept What Is and cannot be changed - is only a waste of time and a drain on our resources and well-being. Accept 'What Is' to learn to live stress-free. Every situation that you get into that's tough, you could look at in a different way - but no matter how you choose to view it, It Is What It Is. In other words, the present moment is happening regardless of which details of the moment you choose to focus your attention on. You may not like What Is, right now, but you have no alternative. There is no re-editing of the present moment - or any one of your past moments either, for that matter. Accept it. The only thing you can change is what will be: Is there something you can do about it? Is there some opportunity to make things better going forward? The more resourceful your frame, the more options and possibilities you'll see to make a big difference for the future. The people who are successfully able to escape the Problem frame - who accept that there are opportunities inherent in every situation, even when it is not clear what they are at the time - are the people who are able to live stress-free. True stress management means being able to deal with stressful events without being "stressed-out." 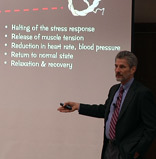 Not all stress is bad - many of us would say we "work well under pressure." But when the stress is too intense, or when it's the wrong type of stress, we get diminishing returns and productivity suffers. If we aren't careful to manage our internal reactions to external stresses, the impact of stress will build up, and sooner or later, we experience the negative effects of chronic stress. Physical ailments like insomnia, ulcer, backache, hypertension - these are all real, organic illnesses that may have a variety of causes, but have been proven as well to be a direct result of chronic stress. In addition to physical maladies, however, chronic stress has also been pinpointed as a cause of a wide variety of psychological impairments, too: depression, avoidance, addiction, relationship problems, and so on. Chronic stress can be a self-sustaining machine, that can cause a person to view everything that comes through the lens of negativity; it can easily become a trap that can seriously damage your health.